Scientists have managed to push back the date for the earliest known presence of a magnetic field on Earth by about 250 million years. The evidence is seen in tiny iron minerals that are aligned inside ancient dacite rocks from the Barberton mountains in South Africa. Analysis of the 3.45-billion-year-old minerals indicates the strength the field was much weaker than today. Earth's magnetic field protects all life on the planet. It forms a shield that deflects harmful particles from the Sun around our world, and limits the ability of this "solar wind" to erode our atmosphere. 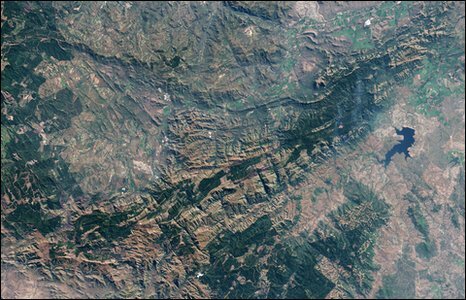 The new work by Professor John Tarduno, from the University of Rochester, US, and colleagues has been discussed at a major Earth sciences meeting in Vienna, Austria. "Earth's magnetic field is important to us," Professor Tarduno told the European Geosciences Union meeting. "[3.45 billion years ago] is a really critical time because it's when we start seeing the first tentative signs of life, so perhaps these two things are linked together." The Rochester team has developed techniques for studying tiny magnetite minerals trapped inside the crystals of volcanic rock. These minerals orientate themselves with respect to the Earth's magnetic field in a cooling magma and lock their positions once the temperature in the host rock dips below 580C. The Barberton samples indicate the nascent field was considerably weaker than today's protective shield. Whereas the modern boundary between our planet's magnetosphere and the solar wind might be located ordinarily at about 10 Earth radii, the ancient boundary would have been much closer - perhaps three to five Earth radii, said Professor Tarduno. He explained that one likely effect of this would have been the production of polar lights, or auroras, at much lower latitudes as many more solar particles breached the shield to collide with atmospheric molecules. It probably also meant the atmosphere lost more of its lighter elements, like hydrogen, faster than had previously been supposed, argued Professor Tarduno. "What that means in an evolutionary sense to us - and this is just speculation but something we want to follow it up - is that perhaps this is suggesting the Earth was much more water-rich very early on," he said. "If, even with this magnetic field, we are losing hydrogen and water, that would suggest the palaeo-Earth in its infant state must have had more water than we think about today." Professor Tarduno's team is now looking back still deeper into the past for evidence of a global magnetic field. The field is generated by convection currents in the molten-iron outer-core of the planet, and finding evidence of an even more ancient field would say much about the interior state of the young Earth. There are volcanic rocks in Africa, India and Australia that possibly retain a record that is 3.6bn years old. "To go back even further in time, however, we don't have the rocks available. But what we do have is certain younger sedimentary rocks that record minerals which were eroded from more ancient rocks - as old as four billion years old," Professor Tarduno told BBC News. "We are developing techniques and we believe we can actually record the Earth's magnetic field in these minerals also."